Custom-built recording booths have aided two Australian experiential marketing campaigns by inviting visitors to share their stories. An old-school phone booth in Melbourne’s Docklands new Library at the Dock invites visitors to pick up the phone and hear a story from their favourite author, then share one of their own to be recorded. 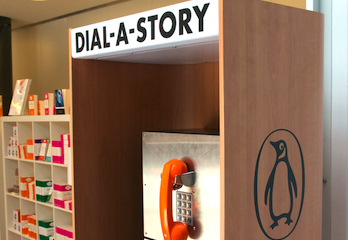 ‘Dial-a-Story’ is a collaboration between Penguin and creative technology agency Sandpit. Participants pick up the phone and listen to a never-before-heard personal story from the life of one of five authors – TV personality John Safran, celebrity gardener Jamie Durie, children’s book author Graeme Base, celebrity chef Maggie Beer or radio personality Father Bob Maguire. The authors then invite the participant to leave their own message. Those who do so receive a unique ticket with an ID and URL to share their story via Facebook or Twitter. Federation Square’s ‘Light in Winter’ festival that took place last month put a twist on the traditional event survey with a video confession booth asking visitors to reflect on the festival’s theme of ‘shrines’. Inside the booth, a custom-build iPad app asked visitors questions around the ‘shrines’ topic such as: What would you build a shrine to? Where would it be located? Who would you take to visit the shrine? An in-built GoPro video camera recorded participants’ answers, uploaded them to Federation Square’s Vimeo channel and played them on the venue’s big screen. Video production company Umbershoot director Brian Cohen said visitors’ answers to the questions were more heartfelt than those typically received by standard surveys. Stories ranges from shrines to family and lost loved ones to football teams, Nelson Mandela and pet guinea pigs. “Footage was surprisingly unique, diverse, honest, and most importantly, directly connected the audience to the theme in an authentic way,” Cohen said.